A little white enameling? Yes, please! This sweet Edwardian era platinum topped yellow gold ring is set with a 0.10 carat Old European cut diamond in the center, surrounded by a scalloped halo of white enamel with two small seed pearls on each side. Shop this lovely ring HERE. Add a little pop of color with this fabulous Art Deco Old European cut diamond and sapphire ring! Shop this beauty HERE. 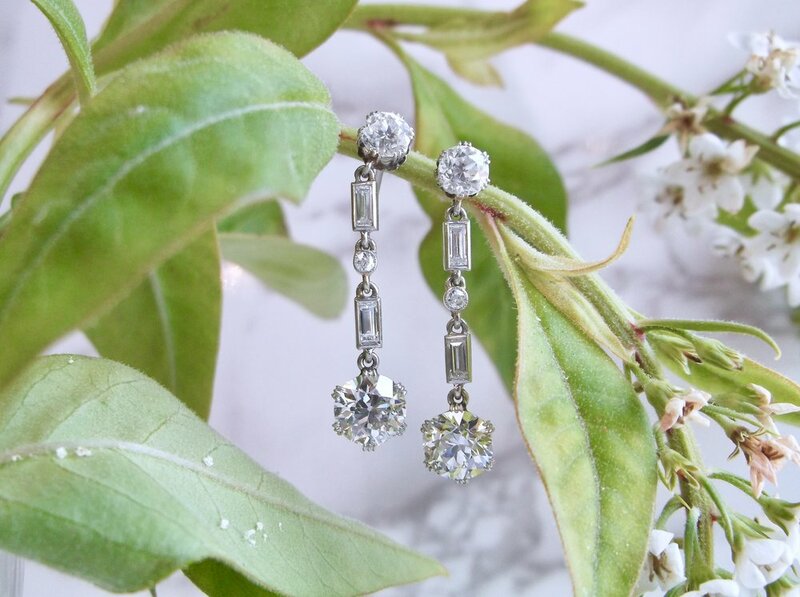 When you need a bit more bling than a classic stud, these fabulous Art Deco diamond drops are sure to fit the bill! These beauties feature over 3 carats in diamonds set in platinum. Shop them HERE. Would you believe me if I told you this fabulous Victorian era Old Mine cut diamond ring was once a bar pin?! It was destined to be this gorgeous ring featuring a center 0.67 carat Old Mine cut diamond with engraved and black enamel details. Shop this lovely ring HERE. Tiffany & Co. stands the test of time. The perfect example? This fabulous 2.05 carat Old European cut diamond and platinum ring circa 1920. Shop this gorgeous ring HERE.